This is in continuation of my earlier post about my experience reaching Bhutan. The bus journey from Phuentsholing to Bhutan would have been boring but for my co-passenger. This was a man and his wife sitting along with us on the last seat of the bus. They were in their traditional Bhutanese national dress, and were continuously chewing on beetle nuts. The Bhutanese have a habit of chewing on raw beetle nuts. The raw beetle nuts have a very strong scent, which can be discomforting to people who are not used to it. It took me quite a lot of time to realize the source of the strange scent and I never quite got used to it through the day long journey. Once while traveling to an out of way place in Bhutan, we suddenly discovered at a check post that we had not taken permit for that place. We were more than half way to our destination and would have hated to be turned back. This person magically appeared there and talked to the check post guards to let us go. He was apparently going to his village which was on the same route. The day we were coming back, we see him again at the bus stand and he travelled back with us in the same bus! If not the world, at least Bhutan is really a small place. 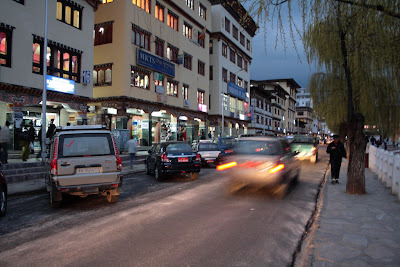 By the time we reached Thimpu it was evening. Thimpu is a really small city. We did have to run around a bit to find a decent place with rooms available. After unpacking our bags and freshening up a bit, we went out for a stroll. It gives the feeling of a quaint neat little town. At the center of the town is an assembly point with an ornate clock tower. Surrounding it are the prominent government buildings, hotels and shopping center. There are many hotels around providing rooms to stay at prices ranging from the cheap to the ultra luxury. If you are the nature loving kind, try and pick one slightly away from the main street so that you get a view of the beautiful mountains and the valley. But if you are the shopaholic kind, stick to the ones around the main street. 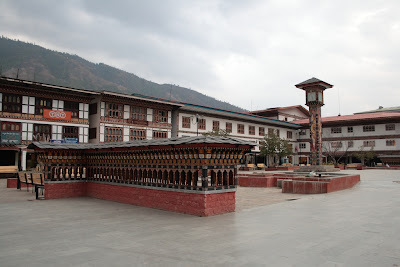 The best of both can be had if you stay at a place in the same lane as the Royal Post Office of Bhutan (Chang Lam, the first major road as you come out from the Thimpu bus stand). We stayed at the Tandin Hotel, on the main market road, but a little away from the market place on Nordzin Lam, towards the Taj Tashi hotel. The market around the Nordzin Lam is lined with handicraft shops. The vegetable shops there among other things sell yummy fresh fruits, yak butter and cheese. Almost every street corner has a big notice board for public notices. That is the only place where we could find any kind of pamphlets, posters and banners, unlike the place I stay at where walls fences and even trees are not spared from ugly posters. There are lots of restaurants around the city center. Though you get all kinds of food, Bhutanese food is the easiest to find and the best tasting, with Chinese coming a close second. People around understand a bit of English and even Hindi - the tourism effect. Most of the shops, hotels and even bars in Bhutan are managed by ladies. The Bhutanese women seem a liberated lot, at least in this matter. I wonder what the men do, probably they work back at the farms. Ema Datshi: Cheese and Chilli preparation. Whitish gravy with green and red chilli pieces. Not too hot, if you are used to spicy Indian preparation, particularly from the south. Thupka: Soupy noodles. Comes in various flavors with vegetables, chicken, sea food, etc. Butter Tea: A preparation of hot water mixed with butter and tea herbs. Does not taste like regular tea, but the Bhutanese swear by its taste. We liked it for its unique taste and the warm liquid felt good in the chill. Alcohol consumption is however has been part of the tradition, and many families still suffer because of alcoholic family members. Alcohol use has also been the cause of many social evils like wife beating. The Bhutanese government has been taking steps to discourage alcohol. We did see many posters in notice boards denouncing alcohol consumption and highlighting its evil effects. Bhutan is also not big in alcohol production, though it is not banned. Most of the alcohol (90%) consumed in Bhutan are imported. 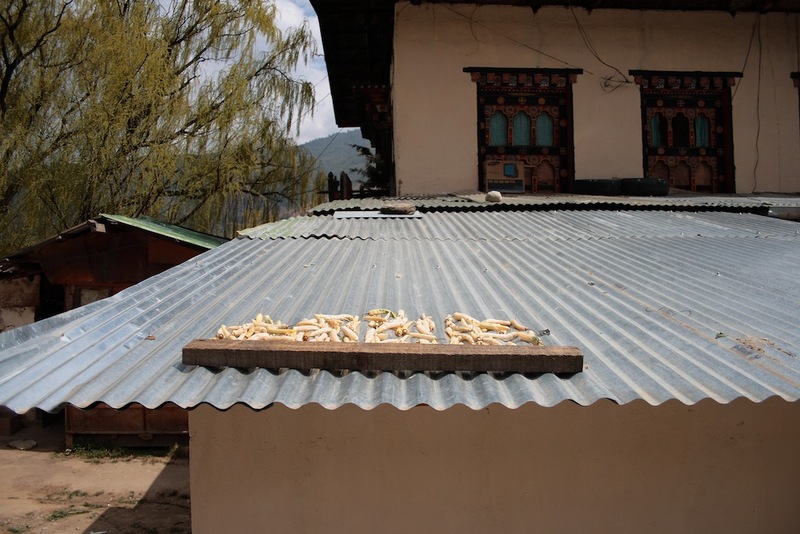 There is a complete ban of tobacco and tobacco products in Bhutan. Clandestine import of tobacco attracts heavy fine and imprisonment. While we were there the local newspapers had a news of a monk facing many years of prison for being caught with tobacco. Visitors are allowed to carry tobacco for self use after paying an import duty of 100%. The Bhutanese (both males and females) are however heavy consumers of raw beetle nut (locally called doma), which is addictive. And that's not a terribly good thing either. Bhutan is however very low in crime rate. Most of the population lives in small villages, close to nature. They don't have a lot of modern amenities like big cars, bikes and TVs, but then when you live at such a beautiful place you don't need any of those. People in general appear happy, contended and proud of being Bhutanese. Bhutan is one of the countries with highest "happiness index", and it is quite visible. Bhutan exports handicraft, timber, fruits, spices, electricity, and cement. Our driver proudly spoke about a new hydroelectricity project coming up near his village and how it will change the face of his village. Bhutan is a constitutional monarchy (like the UK). The small Bhutanese army (around 20000) is trained by the Indian army. Old lady weaving outside her house. The people are simple, friendly and hard working. The person who was our driver, a handsome young man of 25, was an epitome of politeness. He had a small job in the department of culture and drove taxi in the evenings after office hours to supplement his income. 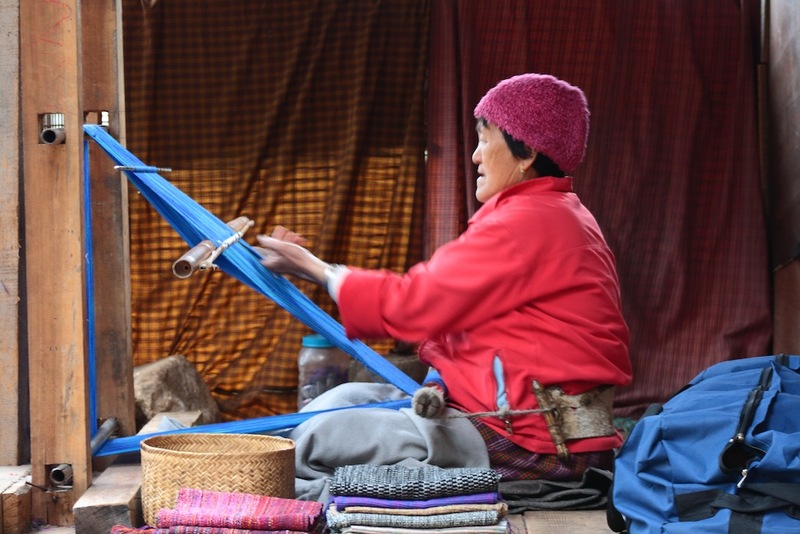 His wife (people marry young in Bhutan) stayed at home, took care of their two kids, tended to a small garden, and spun textiles in a hand loom. The clothes this guy was wearing were woven at home. We actually saw most houses in the outskirts with hand looms and dyed yarns left to dry. The Bhutanese national wear is compulsory for all Bhutanese people employed in government offices. Even otherwise, most bhutanese stick to their national wear. 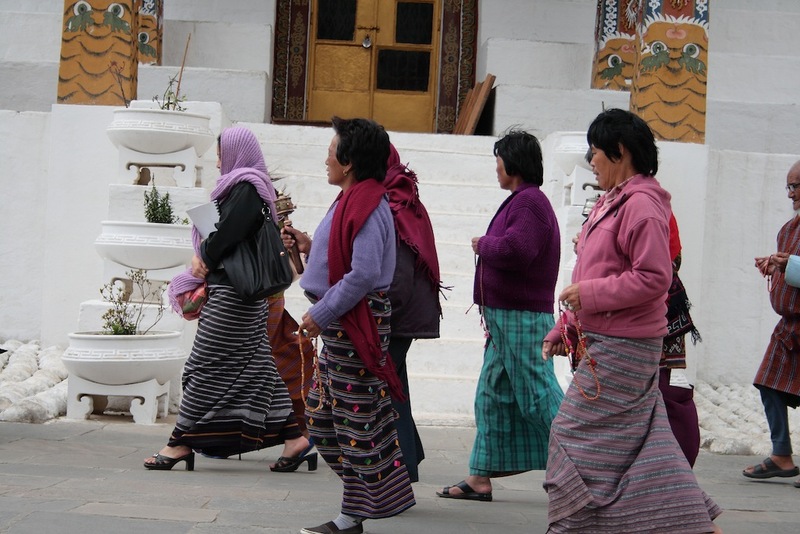 We hardly saw anybody with western wear in Bhutan. Bhutan is a beautiful place, full of nature and unique culture. Over the next couple of days, we went around places in and near Thimpu. 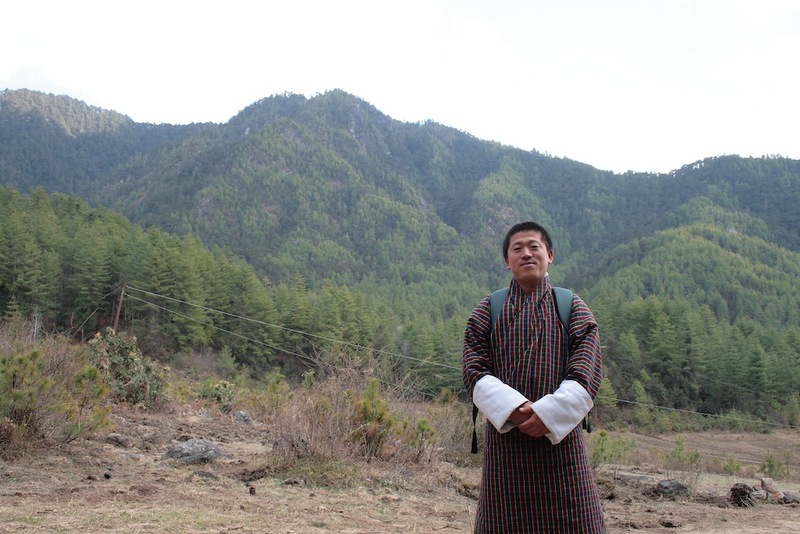 The driver whom we hired at the Thimpu bus stand became our trusted guide during our stay at Bhutan. 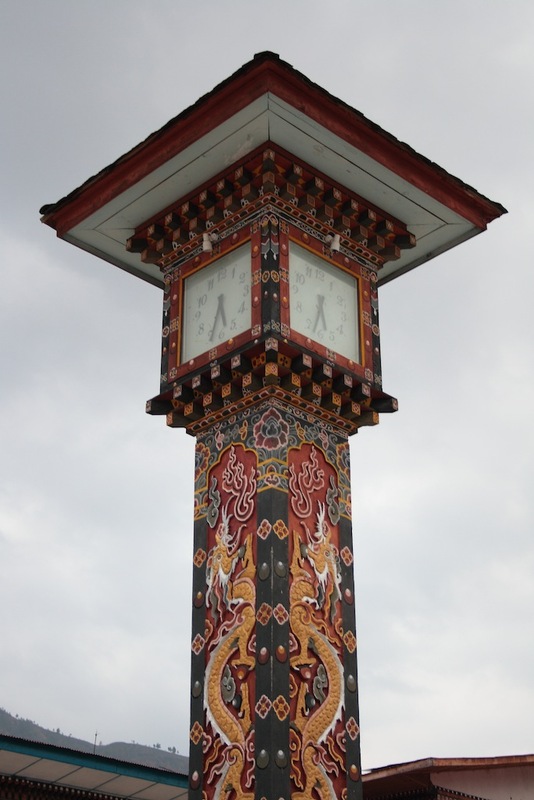 We also visited Paro, which is another major town in Bhutan. More about the places in and around Thimpu & Paro in the next post. Nice to know about Bhutan. Great pics. i envy you TAN, Traveling and experiencing new things are just above all other satisfaction and pleasure. @Deepak Thanks. I think we all envy each other for different things. :) I don't get a chance to travel as much as I would love to. And so I try to make the best of every opportunity I get. wow...this place is on my travel list. im sure i'll be able to use this post has a ref. point. the shot of the assembly pt. has come off real nice! Simply Wow. Bhutan is beautiful. Would so love to visit there. I turst the trip is expensive, right ? This is a great write up. It definitely is a fascinating place, and we are also waiting to go there soon. @Ranting Indian: Thanks. I think expenses depend on one's choice. As I mentioned, we found a good range of prices of places to stay and eat. In general Bhutan is not very expensive. If you are on a tight budget, make friends with a local taxi driver or hotel attendant. They are the best guides. Sounds like Shangri-la, with its quaint lifestyle and high happiness quotient. It is a wonder it has not been spoilt by unbridled tourism. @zephyr It was indeed a very serene place.